This regularly has an attendance of around 40 mums plus children. They are really easy to connect with and thanks to you are seeing a vast improvement in their lives. Many of them now have a new house and all of them are receiving a daily bowl of porridge. They are mainly single mothers trying to survive. Every day they are being taught some basic reading and writing and from May they will be able to learn inside with the opening of some new classrooms. This will also allow them to learn basic domestic skills as well as skills that will allow them to become self sufficient. This will include trades such as weaving, basket making, embroidery and housemaid duties. These new classrooms will also allow the children to have a separate room to play in and hopefully stop disturbing the mothers. Presently the children play with a few toys donated by you on a mat outside, but because they can see their mothers they constantly want their attention. This year we also had 10 abacuses made; these have helped the ladies a great deal with their maths. We would like to fund a full time teacher to help these ladies and also a doctor to come once a week. 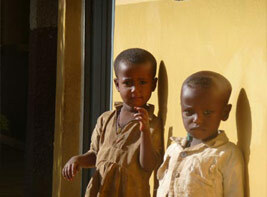 Many of the children have ear and eye infections that could be easily treated with the right antibiotics. Left untreated in the African climate these ailments are potentially very damaging.